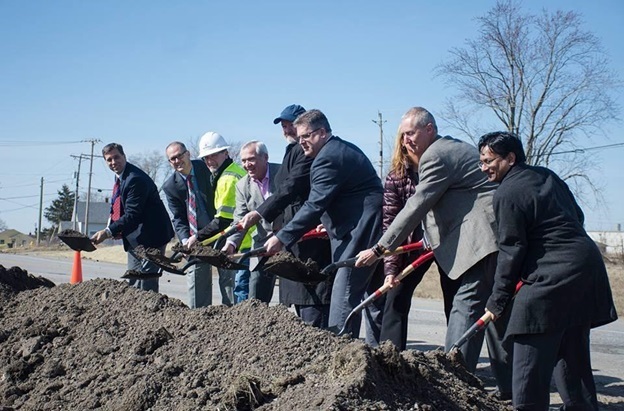 The Fort Wayne Redevelopment Commission has broken ground on improvements to Ardmore Avenue from Airport Expressway to Second Street near the entrance to Fort Wayne International Airport. The project is estimated to cost approximately $3.7 million. Approximately one-mile length of roadway will be under construction until November and will be widened to include a center turn lane, new street lighting, street trees and an asphalt trail along the east side of Ardmore. There will be ADA-compliant curb ramps at the intersections of Second Street, Vanguard Drive and Airport Expressway. In order to address numerous drainage issues, storm sewers will be installed, including curb and gutter inlets and yard inlets. The area will also be made more welcoming and attractive with the addition of new wayfinding signs, as well as a 25-foot lighted gateway marker and landscaping at the southeast corner of Ardmore Avenue and Airport Expressway. The marker was designed and built by Creative Sign Resources, the road project was designed by A&Z Engineering and it is being constructed by E&B Paving. The trail on the east side of Ardmore Ave. is the third phase of the planned Ardmore Avenue Trail, a six-mile planned trail from Jefferson Boulevard to the airport. From the airport, the trail follows Ferguson Rd. to Bluffton Road/SR 1. When the entire Ardmore Avenue Trail is complete, it will connect all of the neighborhoods, residences and businesses along Ardmore Ave. with the Wabash and Erie Canal Towpath Trail at Taylor St., which then connects with over 80 miles of interconnected trails running throughout Fort Wayne.